A healthy and well maintained lawn is the first goal of most property owners. Once you have achieved that with the help of a regular lawn maintenance program from Hutcheson Horticultural landscapers in Woodstock, GA, the next step is to take your landscaping up a level for greater personal enjoyment and visual appearance. The enhancements that our team of professional landscapers can plan and install on your property can take your landscaping from nice to breathtaking and the envy of friends and neighbors. Floriculture is defined as “flower gardening: the cultivation of flowering plants.” The vibrant color, texture and fragrance that flowers provide in a landscape is why floriculture is one of the most popular landscaping enhancements that we provide. Perhaps a perennial garden with recurring blooms, year after year is your style. We can design a plan and install perennials that provide a basis for the tone of your landscape design, whether that be a more formal appearance or the shabby chic charm of an English styled garden. In the Atlanta area seasonal color is always popular, but finding the right mix of plants for your particular site conditions, including sun coverage, moisture levels and overall appearance desired can be difficult for a do it yourselfer to achieve. Lighting can transform your home or facility into a spectacular showplace at night, with Hutcheson Horticultural’s professional outdoor lighting design service. 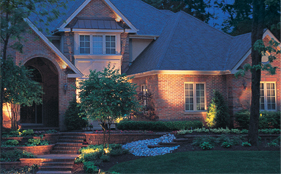 We can plan a combination of different lighting styles to highlight architectural elements of your home or just subtly highlight your lawn, plantings, and landscaping hardscapes. In addition to general enhancement and beauty, illumination also increases security and reduces risks around walkways, decks, pools and other landscape features. To start the next phase of enhancing your landscape, contact the landscaping professionals at Hutcheson Horticultural to request more information or make an appointment with our landscaping design team. Call (770) 924-1001 or use the contact us section of our website.